How to use the Pendle kit builder. Searching for the perfect team kit? Then you’ve come to the right place! 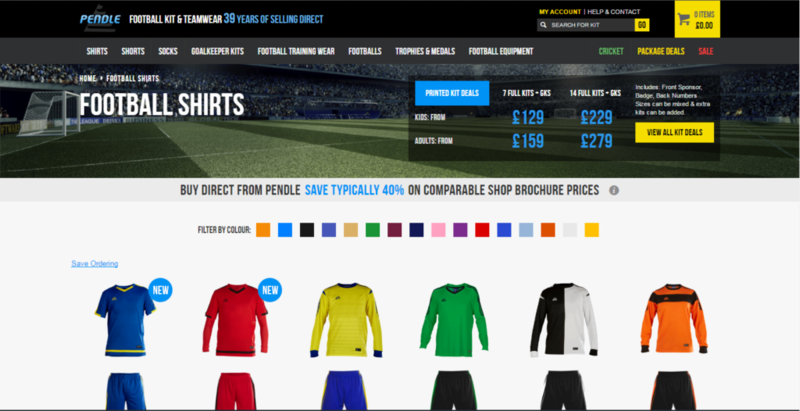 At Pendle Sportswear, we have designed a kit builder that will make creating your team kit a breeze. Three simple steps are all it takes: choose your style, add your customisation, and then place your order! In this post, we will take you through each step, and show how easy it really is. First, choose your football shirt from our wide range of colours and styles. Whether you need a football kit for your junior or adult team, we’re certain we’ve got a kit to suit you, whatever your taste or budget. With 11 ranges and many different colour combinations available, we have over 100 football shirts to choose from. Beginning by choosing your team colours is usually a good place to start; so to help, we have created a colour filter. 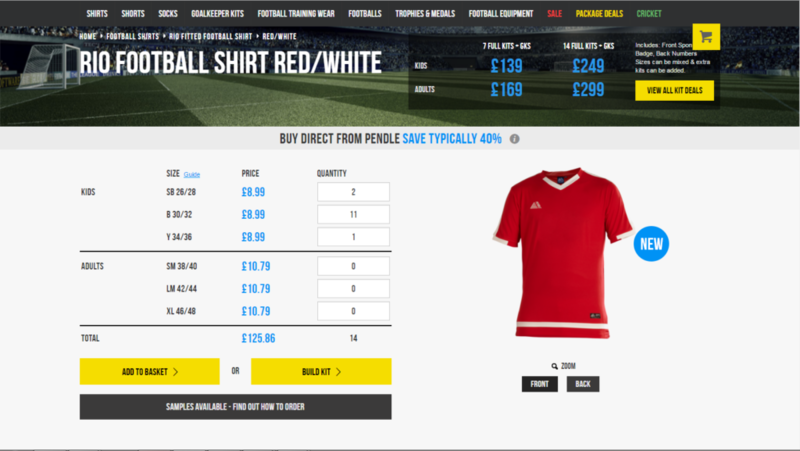 Choose your main team colour and then browse the shirts available. Once you have found a shirt you like, select the sizes and quantities you need. Now you’re ready to build your kit! It’s time to add the shorts and socks. 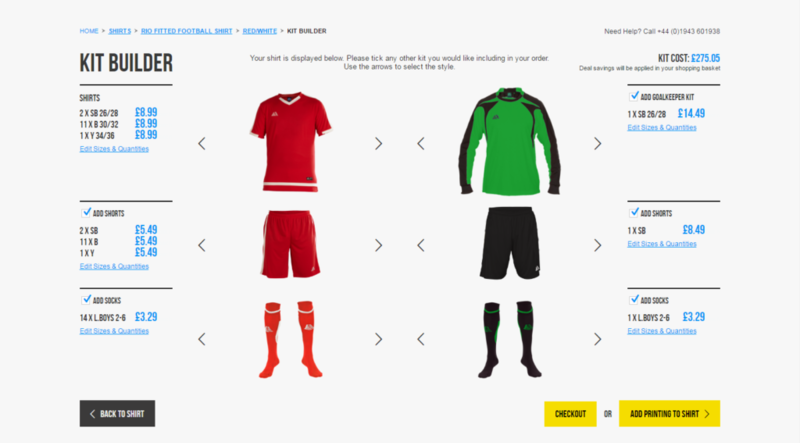 Our clever kit builder will suggest a range of team shorts and socks to match your chosen football shirt. Use the left and right arrows to scroll through the options, and once you are happy with your choice you can begin building your keepers kit. To do this use the options on the right-hand side of the page. Customising your kit has never been easier. To play like a pro you will want to look like a pro, so to give your team that professional look we have options to personalise your kit with an embroidered or printed team badge. 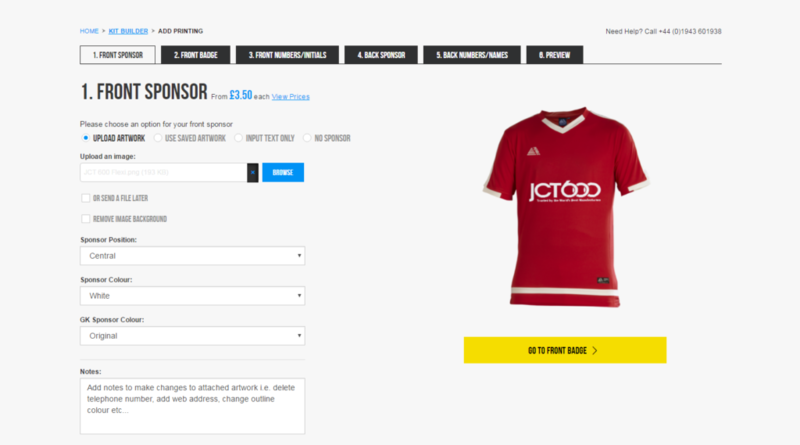 We also have options to add a printed team name, player’s name, numbers, initials and sponsors logo. Upload your artwork to our kit builder, or, if you have already ordered with us before, then it’s even easier. Just select what you require from the artwork saved to your account. Congratulations! You’ve just built your perfect team kit. That’s it, you’ve just built your very own customised football kit! Preview your finished kit, pay or save your order to come back to it later. If can’t wait to show your team their new kit, just use the share button to give your players a sneak preview. Should you require any additional help using our kit builder, give our helpful sales team a call on (01943) 601938 and they will be able to talk you through the process step by step.